This is the story of ‘Tiny’ the trilobite. Tiny started, like all trilobites, from a very small egg under her mother’s belly. She hatched and began her life as microscopic creature of the sea. With only a couple of legs for swimming, she was at the mercy of the warm ocean currents. She could move around on her own, but could not avoid the moving water, unless she got behind a coral. But coral was not something any tiny creature would want to get near! They had tentacles covered with small stinging cells or sticky mucous. Either one would mean Tiny would die. Most of her brothers and sisters met that fate. Only a few of her siblings would live long enough to grow up. Tiny was a lucky baby trilobite. She fed on alga that was even smaller than she was! And she grew… and grew. Her skin would get too tight, so Tiny would molt, shedding her old skin and replacing it with something new and improved. It was better because as she grew, her body was changing, adding more legs and segments to her middle. Months went by. She was able to avoid stinging coral, the innards of clams and lamp shells (brachiopods) and thousands of creatures of all shapes and sizes looking for a small morsel to eat. 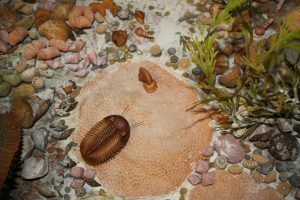 One day, her body became so large after molting many times, that she decided it was time to stop swimming and start crawling around on the sea floor. Her eyes were larger, with lots of small eyes (called eyelets) that pointed in almost every direction. She could see the blue of the sky above her water-world. She could see the green seaweed. Most important – Tiny’s teeny brain could see movement. If an animal tried to sneak up on her, to eat her for breakfast, she could bury herself in the sand and disappear. Life on the sea floor as a young trilobite was no less dangerous than when she was an infant. There were still lots of animals that would love to eat Tiny! She used her many eyelets to watch for predators like squid-in-shells, small fish, corals, anemones and jellyfish. Now a year old, Tiny was a couple of inches long. She used her sensitive feelers to seek out food. Whenever food was in front of her, Tiny would open her scoop like mouth on the underside of her head. It might be alga, bacteria, or very small creatures living on the sea floor. Moving forward and down, she would eat anything in her path. If it was nutritious, her stomach would digest it. If it wasn’t (like silt and mud particles), it would just go through her and out the back end. She continued growing (and shedding her skin) and was now almost three-inches long. Tiny was no longer tiny, she was a full-grown adult trilobite! Was she out of danger? No! While the small predators could no longer eat her for breakfast, she could be a fine, tasty meal for larger animals. Squid-in-shells and fish were the biggest threat. Tiny wandered around on the sea floor for years, always seeking the next meal, ever mindful of the danger of ambush from above or below. One day, she was minding her own business, basking in the warm, shallow ocean, when a shadow passed above her. Instinctively, she dug furiously in the gritty sea bed until only her eyes stuck out – and they were the same color as her surroundings. When the threat swam away, she waited a few minutes before pushing herself out. Another time, a small cone-shaped squid-in-shell came over to investigate her. It was about the same size as Tiny. She tried to dig herself into the mud, but the creatures probing tentacles kept pulling her out. Tiny had another trick. She folded herself up like a pocket-knife, putting her head and tail together. Her legs, gills and feelers were all packed nice and safe inside her hard shell. (Kind of like a roly-poly, but flatter.) The curious young squid-in-shell probed his tentacles trying to figure out what Tiny was doing. Why wouldn’t she play with him? Eventually, he got bored and swam off. Another day, Tiny (who wasn’t truly tiny any more), was looking for food when she detected another trilobite just like her! Now, trilobites didn’t get married, but they did mate and go their separate ways. Tiny laid eggs that rested protectively beneath, against her legs. Eventually, they would hatch and swim away like plankton, just like she started her life. She had several mates over the years, and her babies continued roaming the Devonian sea floor. One day, the sky above the sea was very dark. Winds blew hard, pushing the water fiercely. She was deep enough that the waves didn’t bother her, but the ocean current grew stronger and stronger. She tried to fight the current, but she had become old and her legs just weren’t as strong as they use to be. She tried to bury herself, but the sand would float away rather than settle on top of her. Tiny was exhausted! The storm current rolled her for a short distance until she got wedged under a rock. She was stuck. The sand piled around her, getting deeper and deeper until she was completely buried. Too weak to move, there she died. But that isn’t the end of our story! The Earth went around the Sun 390 million times. One day, a young elementary school student was visiting the Falls of the Ohio State Park on a field trip. The class was exploring the upper fossil beds when the student came upon a rock with a funny-looking pattern on it. A fossil! He showed it to a park naturalist, who oohed and aahed over the discovery: a complete trilobite! How very rare! It is now preserved in the park’s Interpretive Center and will be put on display. Tiny lived a long, long time ago. Geologists call her time the Devonian Period. In years, that would be about 390 million years ago, written out like 390,000,000. That was before people, before mammoths, before T. rex, even before reptiles! During the Middle Devonian, the kings of the world were fish. Trilobites died out – became extinct – by the end of the Permian Period, during the greatest extinction in Earth’s long history. Is the story something that happened recently? What creatures liked to eat baby trilobites? Bigger trilobites? What did baby (and adult) trilobites eat?